Where Are We Going? Movement and Mobility in Mesolithic Research. In this article I will discuss some of the most dominant approaches to early prehistoric, and in particular mesolithic movement and mobility. After outlining the significance of mobility studies to mesolithic research I shall briefly review the most commonly employed models of mobility, including some of their greatest problems and shortcomings. As a way forward I will then offer an alternative approach, based on an integrated study of lithic artefacts within a landscape perspective. To test and illustrate this approach I will present three brief case studies from different parts of Ireland. There are several concepts which we all tend to use regularly in mesolithic research without investing much thought in their meaning. For example the category ‘mesolithic hunter-gatherer’ generally rolls off the tongue or pen without much consideration of its further implications but brings with it additional sets of assumptions relating to subsistence economy, social organization, division of labour, gender roles and settlement mobility, to name but a few. My contribution here will primarily look at the last of these with a special focus on recent approaches taken to hunter-gatherer and mesolithic mobility in archaeology. I will begin with a critical review of the ways in which we approach mobility in mesolithic research. After this I will move on to offer different ways of thinking about movement and, based on these, an alternative approach to mobility in mesolithic research. I will then explore this approach somewhat further in practical terms in the form of a number of short case studies based on my own research in Ireland. These case studies are specifically geared towards studying and understanding human movement in the early prehistoric past. Discussions of mobility have been part and parcel to mesolithic research more or less since the establishment of ‘the Mesolithic’ as an archaeological period. (Throughout this text I employ names for archaeological periods such as ‘mesolithic’ and ‘neolithic’ in their adjectival form only and have therefore chosen to de-capitalise them. This is to emphasise that these are heuristic categories, helping us to discuss sets of material evidence rather than real entities that had any meaning in the prehistoric past.) In particular this is the case since the marriage of mesolithic studies with hunter-gatherer anthropology in the 1960s, best expressed in Lee and DeVore’s (1968) statement that hunter-gatherers move around a lot and live in small groups (Lee & DeVore 1968, 12). Yet interestingly, despite being always present in the discussions, movement has mostly remained at the periphery of mesolithic and hunter-gatherer studies. While some studies have focused on ‘mobility [as] a critical aspect of hunter-gatherer adaptation’ (Smith 2003, 162; see also Kelly 1992) more often than not movement appears to be simply taken as a given to explain other phenomena, such as artefact distribution or to reconcile environmental, ethnographic and archaeological evidences. As Finlay (2004) has observed, we ‘measure movement not by considering the processes involved: the following of tracks and trails, the paths and routeways, but like the wind, by its effects on other things’ (Finlay 2004, 3). But why is it important that we study or try to understand mobility in early prehistory and what do we actually mean by ‘mobility’? In a recent paper Close (2000) suggests that in archaeological terms mobility is mostly equated ‘with the act of moving’ and concludes that ‘we deal, then, with actual movements of people and face such questions as how far, in what direction, how often, and even why’ (Close 2000, 50). Having made clear what we tend to refer to when we discuss mobility we must still deal with the significance of doing so. Kelly ( 1992) points out that ‘it is important that we learn to recognise the various forms of mobility archaeologically, because the ways people move exert strong influences on their culture and society’ (Kelly 1992, 43). In other words, by studying the ways people moved in the past we should be able to gain a wider and deeper understanding of their social, cultural and economic activities more generally. Any researcher working in the field of mesolithic studies will have come across one or another of the models of forager settlement and mobility strategies. Elsewhere (Kador 2003; 2005, 108 – 110) I have discussed the most dominant of these models, frequently employed in mesolithic research in some detail, such as Binford’s (1980) ‘forager-collector model’ or Clarke’s (1972) ‘upland-lowland’ one (see also Mellars 1976). Therefore there is no need to delve into the history of mobility model building or outline the parameters of these models once again. Instead in this contribution I will primarily focus on more recent ways of approaching (hunter-gatherer) mobility and question the usefulness of these approaches to aid our understandings of early prehistoric people’s movements and their daily lives more generally. As I have outlined, mobility has for the past four decades maintained a constant presence within mesolithic research yet at the same time has remained on the sidelines as a subject of interest in its own right. In recent years a number of publications have rekindled the debate around mobility in mesolithic northwest Europe. In particular a special issue of the Journal of Anthropological Archaeology (Lovis et al. 2006 eds) has been dedicated entirely to ‘Mesolithic Mobility, Exchange and Interaction’. Apart from this volume, mobility has also featured strongly in a number of other recent publications such as Brantingham (2006), Eriksen and Fisher (2002), Smith (2003) and Close (2000). However, the last two of these publications are primarily concerned with hunter-gatherer groups of prehistoric North America rather than mesolithic Europe and in general it is interesting to note that the reopening of the debate on mobility appears to be largely driven by researchers from a North American background. The approaches to mobility they advocate appear to be quite distinct from developments on the same front in northwest Europe, as recently reviewed by Wickham-Jones (2005). Yet the fact that these publications have brought hunter-gatherer and mesolithic mobility back on the agenda must be warmly welcomed. It opens up new opportunities to discuss this important practice and how it relates to other aspect of daily life in early prehistory. Lovis et al. (2006) suggest that ‘[m]obility and interaction are always outcomes of multiple, sometimes congruent and sometimes conflicting, needs and decisions faced by hunter-gatherers’ (Lovis et al. 2006, 271-272). This statement illustrates well the position assumed by many of the recent contributions to mesolithic movement and mobility. 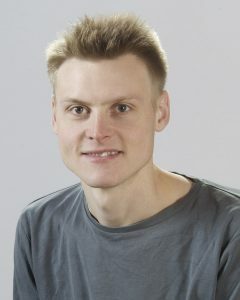 While it accommodates hunter-gatherers’ social complexity and gives them the opportunity to make decisions, on a more careful reading it becomes clear that it actually represents people as passive recipients to outside factors, be they environmental stress, population pressure, resource availability, conflict etc. They then (are forced to) respond to these outside influences with which they are ‘faced’ through moving and/or interacting with others. The assumption would seem to be that their movements are merely a consequence of or response to other phenomena beyond their control and can thus serve as an index for these. This perception of the hunting and gathering populations of mesolithic (and indeed palaeolithic) Europe and prehistoric North America, as constantly responding to outside pressures lies at the heart of many of these recent studies of mobility. The ideas underlying these studies differ little from those put forward by Binford (1978; 1980) and they make no attempt to replace or rethink Binford’s (1980) mobility models firstly formulated nearly three decades ago. Instead many of the authors appear to impose these models more or less directly onto their evidence even reusing Binford’s original terminology. (Eriksen & Fisher 2002, 3). In practice this means that these models and constructs derived from generally unidentified ‘Western Hemisphere hunter-gatherer analogs’ (Donahue and Lovis 2006, 254) serve as a straight jacket for the material and landscape evidence from early prehistoric central and western Europe, with discussions focussing on identifying ‘logistical’ and ‘residential’ sites and associated ‘mobility strategies’. This has the effect that the contributions appear to add rather little to the questions they set out to tackle; how did people move in mesolithic Europe and what lies behind their bipedal expressions? This reading of past human behaviour more or less straight off the ethnographic record represents one of the main difficulties with such models, as they are based on an assumption that hunter-gatherer behaviour is to some degree predictable. However, in studying ethnographic data and literature there appears to be one central rule; variability. That is, we should not expect hunter-gatherers to behave in the way we would like or expect them to. There does not appear to be a clear correlation between the environmental setting and hunter-gatherer mobility and even different ethnographic studies of the same group can result in strikingly different figures for numbers of trips and distances moved annually (cf. Binford 2002, 118 – 129 and Kelly 1995, 112 – 115). This makes it very difficult to employ ethnographic data from hunting-gathering-fishing groups from anywhere in the world to meaningfully model or predict mesolithic movement patterns. Therefore any application of ethnography to the archaeological record beyond the mere purpose of making us consider alternative interpretations must be treated with extreme caution. Yet given this huge amount of variability between but also within relatively small hunter-gatherer communities, one only needs to search for long enough to find an example that fits or supports ones model. This, however, cannot be taken, as sometimes happens, as confirmation that the model must be true. Consequently if we want to understand movement in mesolithic Europe it seems we have no alternative but to get back to directly engaging with the archaeological evidence. Our challenge is thus twofold. On one hand, we need to put in place frameworks more suitable to utilise the available archaeological evidence from mesolithic Britain and Ireland to discuss people’s movements and mobility. On the other hand, we also need to invest much more thought into interpreting and understanding the social significance people’s ways of moving held in the past. Both of these dimensions appear very much under represented in northwest European early prehistoric research. Let us firstly deal with the second of these challenges – how can we think and write in more engaging ways about people’s movements? (Ingold 1986, 153; emphasis in original). This statement – which like the models above is derived from hunter-gatherer ethnography – demonstrates that people’s lives, their social roles, activities and their environment evolve together and unfold gradually as people move through the world one step at a time. It will be immediately apparent that this notion of movement is very different from the ideas of mobility discussed above. It paves the way for an approach that acknowledges that social, economic and ideological considerations are all inseparable parts of the processes of daily life, as for most small scale societies ‘ideology forms a fundamental aspect of day-to-day subsistence activities and cannot be separated from economic concerns’ (Tilley 1994, 68). An example from North American ethnography highlights this relationship between subsistence, ideology, social forces and human movement beautifully. If we start viewing mesolithic hunter-gatherers as socially active human beings not confined by Cartesian principles, the two dimensional models of subsistence based procurement and mobility strategies give way to intimate accounts of journeys that people in mesolithic times embarked on and places they visited along them. However, we must also be careful to firmly ground such accounts in a ‘rigorous engagement with […] archaeological data sets’ (Jordan 2003, 130). This leads us to the other challenge identified above, that of utilising the available material evidence for the study of mesolithic movement in imaginative and innovative ways. In recent years several promising new sources of evidence for mesolithic activity have become more accessible, as reflected by some of the other contributions to this themed issue of Internet Archaeology. 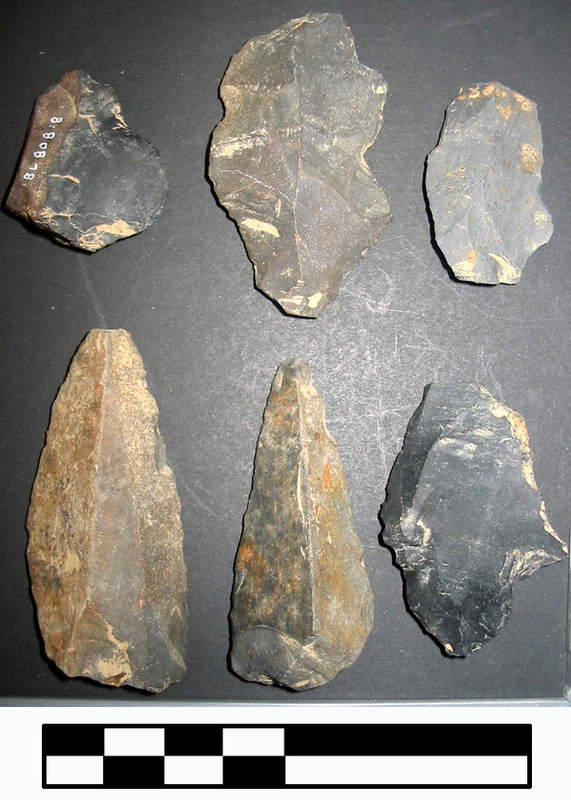 Yet in many cases lithic artefacts remain nonetheless the backbone for much of our understanding of mesolithic lifeways, simply because they tend to be so much more common and widespread throughout early prehistory and across most parts of Europe. This is very much the case in relation to Irish mesolithic evidence where survival of organic materials dating to this period is extremely limited. Therefore my own research focuses on integrating lithic artefact and landscape evidence from a number of study areas within Ireland in order to understand the ways in which people moved in early prehistory. Space here does not allow me to provide a detailed outline of my research methodology, which I have discussed in other publications (Kador 2005, 110-111; forthcoming). I will therefore move straight to presenting some of my work on movement and mobility in early prehistoric Ireland. 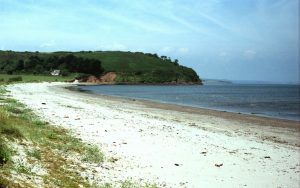 The first example takes us to the Waterford Harbour area of southeast Ireland (Figure 1). This area represented a blank canvas in terms of evidence for early prehistoric activity until the 1980s. An intensive programme of field survey and excavations carried out by the Ballylough Archaeological Project (BLAP) between 1983 and 1989 recovered a substantial lithic artefact assemblage and identified several mesolithic, neolithic and early bronze age find locations (Zvelebil et al. 1987; Green & Zvelebil 1990). 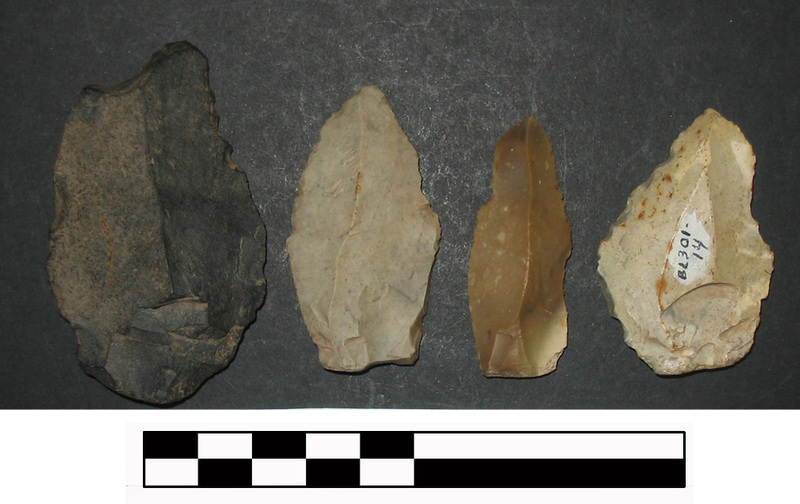 My own research in the area involved an integrated approach to the use of lithic artefacts across the landscape in the hope that this may reveal interesting aspects about people’s movements in early prehistory. Here we can observe that people appear to have moved objects made of different raw materials in very different ways but also that these patterns appear to have changed and developed over time. There, at locations between 200 and 500m away from the shore, they would test the pebbles, discard unsuitable ones, failed cores and flaking mishaps. Once they had finished this process they would move on – apparently further inland – bringing with them ready made objects, pre-forms quickly modified to suit a particular requirement, and some of the better quality cores to produce flakes as needed. In their movements further away from the shore people would have used their objects heavily, reworked and retouched them more frequently and eventually discarding them or perhaps carefully depositing them in the appropriate place. 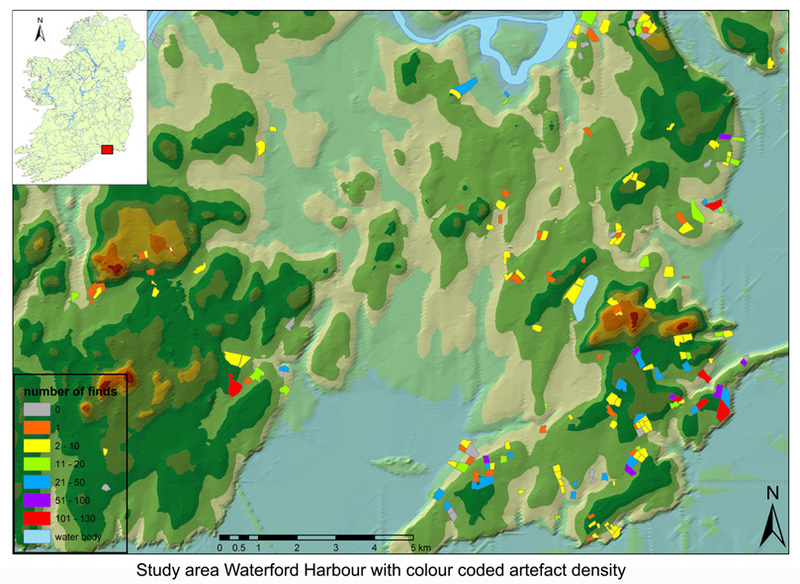 This is reflected in the fact that finds further inland are predominated by highly worked and retouched artefacts while cores and primary material are largely absent (Figure 5). Some 80 km further north along the river Barrow (Figure 1), Ireland’s second largest river, an intensive programme of fieldwalking over two seasons from 1990 to 1991 was conducted also by the BLAP. This has produced a small lithic assemblage of 803 artefacts 39 (4.9%) of which were identified as diagnostic mesolithic pieces. It appears that the largest part of these objects was manufactured on what could be described as local raw materials. Almost three quarters (71.8%; n=28) of them are made of chert (Figure 6) which can be found in outcrops of the Carboniferous limestone to the west of the study area as well as in glacial drift deposited throughout the valley (Feehan 1983, 26 – 27, 95). Equally most of the flints, making up about 20% of the overall assemblage, appear to have been derived from local sources, primarily in the form of small riverine and glacial drift pebbles that can be found in limited quantities throughout the Barrow Valley. 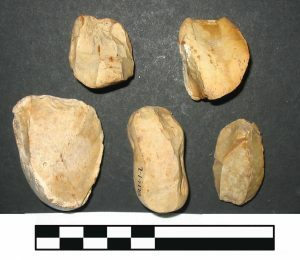 However, a small proportion of the flint objects is too large in size and too high in quality to have been obtained from these local drift pebbles (Figure 7). The only known Irish source yielding such good quality flint pebbles and nodules large enough to make these objects is the northeast of the country, along the north Leinster or East Ulster coast, located somewhere between 100 and 200km from the Barrow (Figure 8). Interestingly the large flint objects in question represent almost without exception diagnostic mesolithic forms and also show significantly more intensive retouch than any of the other objects within the Barrow valley assemblage. This could be interpreted to further supporting the notion that these objects were moved considerable distances but also that people kept them in circulation for prolonged periods of time. Another diagnostic later mesolithic objects made of rhyolite was found at the northern limit of the study area (Figure 9). This object appears to have originated from broadly the same region as the large flints, also located some 150km northeast (Rynne 1983/84; Kador 2007, 37 – 40). 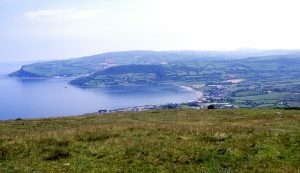 Figure 8: Carnlough beach, County Antrim; potentially one of the main sources of large pebble flint found in the Bann Valley and elsewhere in Ireland. In summary, in the Barrow valley we can recognise different groups of artefacts some of them clearly indicating movement and contacts over substantial distances while others suggest more small scale trips within a rather confined area. 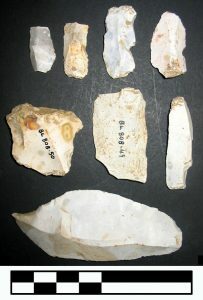 However, more interesting still is the fact that all the larger higher quality mesolithic flint objects, as well as the rhyolite one, most likely originating in the northeast of the country, have been found at a select number of locations of higher artefact concentration along the River Barrow (Figure 10). 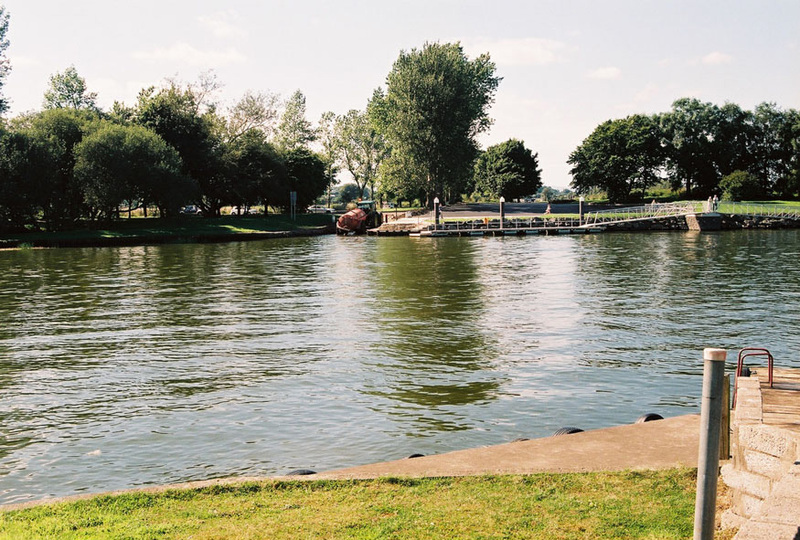 All of these locations are positioned close to rock banks in the river which would have formed natural crossing points or fording places in the past. 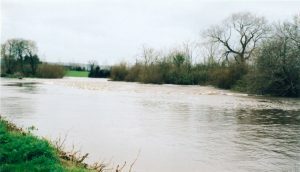 Furthermore they also coincide with locations of confluences between the river Barrow and some of its larger tributaries (Figure 11). It appears therefore as if these locations make reference to the importance of mobility in people’s lives, as represented by movements along the courses of the Barrow and its tributaries as well as across them, utilising the fording points. In an area, such as the middle Barrow Valley with relatively few striking natural features, such places would have represented welcome landmarks where people from different parts of the country could have come together. They are locales that emphasise both movement and congregation. Elsewhere (Kador forthcoming) I have argued that the large later mesolithic objects found exclusively at these locations could perhaps have epitomised tokens for contacts and connectedness with people and places in other areas; in particular with locations and communities in those regions of northeast Ireland, where the objects had originated. Figure 11: The confluence of the River Barrow and the River Greese near an ancient fording point that has produced mesolithic artefacts. 4.3. 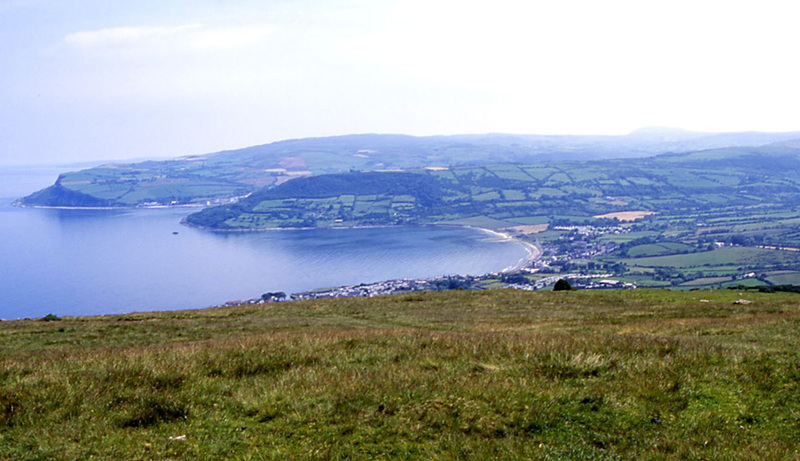 The Antrim Glens and uplands, County Antrim, northeast Ireland. Figure 12 (right): Chalk rocks near Glenarm, County Antrim with bands of flint stretching across them. Finally, in northeast Ireland (Figure 1) movement of stone in later mesolithic times appears to take a highly organised form. 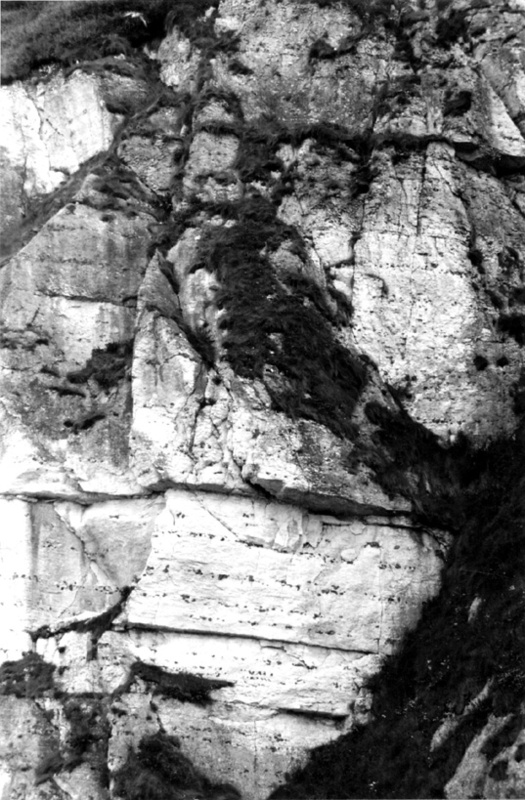 High quality flint appears here in abundance along the coast in the form of large nodules and pebbles cropping out from the chalk (Figure 12) and washed out onto the beaches (see Figure 8 in section 4.2). 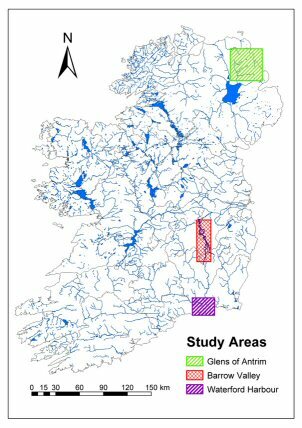 Large numbers of roughed out and finished flint objects (Figure 13) but only very small amounts of cores have been identified deposited along the River Bann, which extends north-south near parallel to the coast some 40 – 60km inland. Thus the only viable explanation is that these objects found their way from the coast across the Antrim plateau and into the valley ‘by human means’ (Woodman and Johnston 1991-92, 134-136). 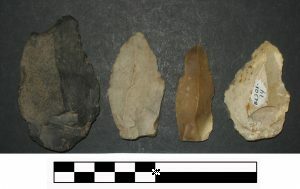 Figure 13: Typical diagnostic later mesolithic flint objects from County Antrim. Similarly to the river Barrow, many of the find locations would appear to mark out particular places such as fording points, intersections and junctions of the river, all of which could be seen to have held specific significance in people’s movements across the land. It is also interesting that other materials were transported to the same locations. 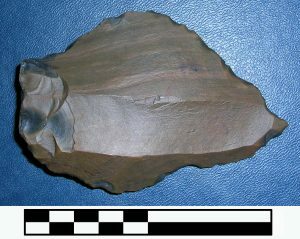 Baked mudstone axes and several chert flakes, both materials probably originating some 80km to the south (Woodman 1987, 144; Woodman and Anderson 1990, 382) were brought into the valley. The traditional explanation for this has been that all these locations – the flint rich Antrim coast, the east midland plains, producing chert and mudstone, and the Bann valley, where the objects were found – represent ‘stations’ along people’s seasonal round. This would represent in total a circuit of well above 200km. Moreover, the fact that no mudstone axes and only one chert flake are known from mesolithic find locations on the Antrim coast would speak against this assumption. It seems more likely that these places along the River Bann, marked out by deposits of various stone objects of different raw materials, brought people from different parts of the country together who in turn brought with them various artefacts made from several types of stone. Some of these locations, such as Newferry (Woodman 1977), show evidence for continuous return visits over at least 2 millennia (between c.6000 and 4000BC) spanning virtually the entire later mesolithic period. It is also interesting to note that Newferry represents the location of a fording point of the river Bann (Figure 14), highlighting the place’s importance in people’s movement’s. Another important factor here is that materials such as carboniferous chert, which is clearly inferior to the east Antrim flint in knapping properties and durability, was transported for much greater distances than the latter. From this we can infer that people’s movements and the movement of stone objects with them did not serve purely functional concerns. This finding counters any arguments that this represents evidence for logistical mobility. Instead the evidence suggests a complex and elaborate social network of people coming together and making commitments – enshrined in objects – to stay in touch with each other. In contrast to the standard ways of viewing mesolithic movement which emphasise subsistence and environmental factors as driving hunter-gatherer behaviour, though brief in their treatment of the evidence, the case studies presented above have shown that people in later mesolithic Ireland moved in both complex and varied ways. They have also hinted that procuring the most favourable raw material or subsistence considerations were not necessarily at the forefront in their decision making about how, when and where to move. The case studies from Antrim and the Barrow Valley have especially pointed towards a social significance of movements in people’s daily lives and suggest the importance of certain places associated with movement, in these two cases near the banks of large rivers. These were locations that facilitated people from various parts of the country to come together and exchange objects but also other ‘things’ such as news, knowledge and stories. The implications of my findings are twofold, firstly they allow us to revaluate some of the commonly held perceptions about Irish mesolithic evidence and activities. Secondly there are also wider considerations about our treatment of the subject of movement and mobility in mesolithic contexts more generally. The integrated study of the use of lithic artefact collections ‘across the landscape’ has not previously been attempted in an Irish early prehistoric context. Although there have been several landscape based surveys focusing on early prehistoric activity and thus primarily lithic evidence (Woodman 1983; Green and Zvelebil 1990; Zvelebil et al. 1996), their analysis of the lithic artefact assemblages was never really integrated with the landscape evidence. Therefore the addition of this dimension to the various early prehistoric collections from Ireland has the potential to greatly enhance our understanding of both mesolithic and neolithic activity throughout this island. It also allows us to start discussing this material at a more human everyday scale as opposed to the very small scale assumed by lithic analysis or the broad scale of landscape surveys. By bringing these two scales together and focussing on the processes underlying the patterns identified we have a realistic chance of meaningfully discussing people’s social actions and interactions with one another and with the world around them. This focus on a human scale of analysis highlighting people’s social lives and actions in the past will also help us to review and refine our models and constructs of early prehistoric movement in northwest Europe and beyond. As even the brief snapshots from my research have demonstrated, this perspective challenges the notion of prehistoric hunter-gatherer groups having based their decisions (whether in relation to movement or otherwise) primarily on functional or economic considerations. These fresh approaches to mesolithic mobility allow us for the first time to move away from the two dimensional ‘lines and arrows across maps’ and discuss actual human movement. In turn they also facilitate a breaking out from the strictly economist frameworks that have confined hunter-gatherer studies for much of the past four decades. No work currently in the published literature comprehensively addresses the question of early prehistoric and specifically mesolithic movement beyond the rather deterministic models discussed at the start. Ingold (2000) provides very useful ideas in relation to hunter-gatherer movement and other daily practices from an anthropological perspective and thus a good starting point. Many of the ideas expressed by the contributors in Warren and Conneller (2006) will be useful in consolidating Ingold’s approaches with mesolithic material evidence. Little further early prehistoric work has been conducted in relation to the first two case study areas, apart from the publications mentioned. However, the recent publication of a volume dealing with the Keiller-Knowles collection (Woodman et al. 2006) – the largest assemblage of prehistoric lithic artefacts from county Antrim and possibly Ireland – is of particular interest to my work in the Co. Antrim study area. The volume also provides an up to date review of Irish prehistoric lithic technology. Binford, L. R. 1978 Nunamiut Ethnoarchaeology. New York, Academic Press. Binford, L., R. 1979 ‘Organization and formation processes: looking at curated technologies.’ Journal of Anthropological Research, 25, 255-273. Binford, L. R. 1980 ‘Willow smoke and dogs’ tails: hunter-gatherer settlement systems and archaeological site formation.’ American Antiquity, 45, 4-20. Binford, L., R. 2002 Constructing frames of reference: an analytical method for archaeological theory building using ethnographic and environmental data sets. Los Angeles, University of California Press. Brantingham, J. P. 2006 ‘Measuring Forager Mobility.’ Current Anthropology, 47, 435-459. Clarke, D. 1972 Models in Archeology. London, Methuen. Close, A. E. 2000 ‘Reconstructing Movement in Prehistory.’ Journal of Archaeological Method and Theory, 7, 49-77. Conneller, C. 2000 ‘Fragmented Space? hunter-gatherer landscapes of the Vale of Pickering.’ Archaeological Review from Cambridge, 17, 139-150. Donahue, R. E., and Lovis, W. A. 2006 ‘Regional settlement systems in Mesolithic northern England: scalar issues in mobility and territoriality.’ Journal of Anthropological Archaeology, 25, 248-258. 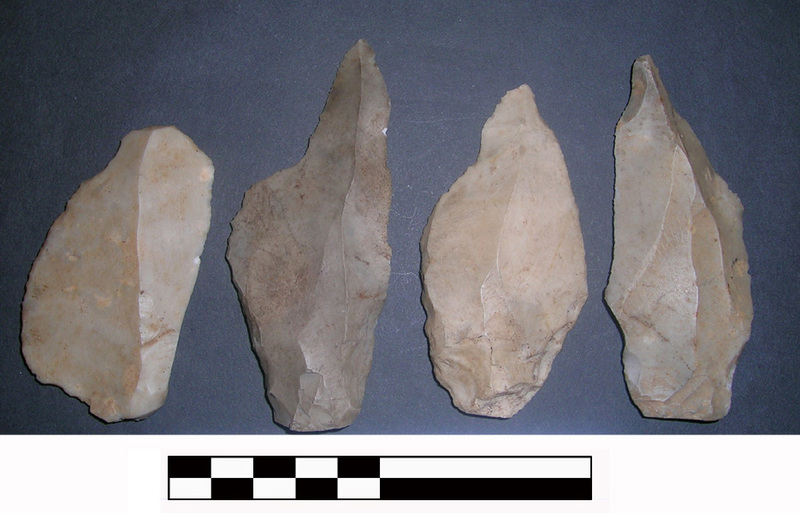 Eriksen, B. V., and Fischer, L. E. 2002 ‘Lithic raw material economy in later glacial and early postglacial western Europe: introduction’ in L. E. Fischer, and B. V. Eriksen (eds) Lithic Raw Material Economy in Later Glacial and Early Postglacial Western Europe, 1 – 5. Oxford, Archaeopress, BAR British series 1093. Feehan, J. 1983 Laois: an environmental history. Stradbally, Co. Laois, Ballykilcavan Press. Finlay, N. 2004 ‘E-scapes and E-motion: other ways of writing the Mesolithic.’ Before Farming 2004, 1. http://www.waspress.co.uk/journals/beforefarming/journal_20041/abstracts/index.php. Last accessed: 10 October 2007. Green, S. W., and Zvelebil, M. 1990 ‘The Mesolithic colonisation and agricultural transition of south east Ireland.’ Proceedings of the Prehistoric Society, 56, 57-88. Ingold, T. 2000 The Perception of the Environment: Essays in livelihood, dwelling and skill. London, Routledge. Jackson, J. B. 1994 A sense of place, a sense of time. London, Yale University Press. Jordan, P. D. 2003 ‘Investigating Post-Glacial Hunter Gatherer Landscape enculturation: ethnographic analopgy and interpretative methodologies’ in L. K. Larsson, H. Knutsson, K. Loeffler, D. and Akerlund, A. (eds) Mesolithic on the move: Papers presented on the sixth international conference on the Mesolithic in Europe, Stockholm 2000, 128-138. Oxford, Oxbow books. Kador, T. 2005 ‘Reopening old trails – rethinking mobility: a study of the Mesolithic in northeast Ireland’ in D. Hoffmann, J. Mills, and A. Cochrane (eds) Elements of Being: mentalities, identities and movements., 107-120. Oxford, Archaeopress, British Archaeological Report Series 1437. Kador, T. 2007 ‘Stone Age motion pictures: an object’s perspective from early prehistoric Ireland’ in R. Johnston, and V. Cummings (eds) Prehistoric Journeys, 33-44. Oxford, Oxbow Books. Kador, T. forthcoming. ‘Moving perceptions: movement, mobility and the material dimension’ in P. C. Woodman, S. Mccartan, G.M. Warren, and R. Schulting (eds) Proceedings of the MESO2005 Conference on the Mesolithic in Europe, Belfast 2005, Oxford, Oxbow. Kelly, R. L. 1983 ‘Hunter-gatherer mobility strategies.’ Journal of Anthropological Research, 39, 277-306. Kelly, R. L. 1992 ‘Mobility/Sedentism: Concepts, Archaeological measures and effects.’ Annual review of Anthropology, 21, 43-66. Kelly, R. L. 1995 The Forager Spectrum: Diversity in hunter-gatherer lifeways. London, Simthsonian. Lee, R. B., and DeVore, I. (eds) 1968 Man The Hunter. Chicago, Aldine. Lovis, W. A., Whallon, R., and Donahue, R. E. 2006 ‘Introduction to Mesolithic mobility, exchange, and interaction: A special issue of the Journal of Anthropological Archaeology.’ Journal of Anthropological Archaeology, 25, 175-177. Mellars, P. A. 1976 ‘Settlement Patterns and Industrial variability in the British Mesolithic’ in G. Sieveking, I. H. Longworth and K. E. Wilson (eds) Problems in Economic and Social Archaeology, 375-99. London, Duckworth. Rynne, E. 1983/84 ‘An Antrim Bann flake from near Monasterevin.’ Journal of the Kildare Archaeological Society, 16, 328-330. Smith, C. S. 2003 ‘Hunter-gatherer mobility, storage, and houses in a marginal environment: an example from the mid-Holocene of Wyoming.’ Journal of Anthropological Archaeology, 22, 162-189. Warren, G. M. and C. Conneller (eds) 2006 Mesolithic Britain and Ireland. Stroud, Tempus. Wickham-Jones, C. R. 2005 ‘Summer Walkers? – Mobility and the Mesolithic’ in N. Milner, and P. Woodman (ed) Mesolithic Studies at the beginning of the 21st century, 30-41. Oxford, Oxbow. Woodman, P. C. 1977 ‘Recent Excavations at Newferry, County Antrim.’ Proceedings of the Prehistoric Society, 43, 155-200. Woodman, P. C. 1983 ‘The Glencloy project in perspective’ in T. Reeves-Smyth, and F. Hammond (eds) Landscape Archaeology in Ireland., 25-34. Oxford, BAR British Series. Woodman, P. C. 1987 ‘The Impact of Resource Availability on lithic industrial traditions in prehistoric Ireland’ in P. Rowley-Conwy, M. Zvelebil and H. P. Blankholm (eds) The Mesolithic in north-west Europe: recent trends., 138-49. Sheffield, Department of Archaeology and Prehistory. Woodman, P. C., and Anderson E. 1990 ‘The Irish later Mesolithic: a partial picture’ in P. M. Vermeersch, and P. Van Peer (eds) Contributions to the Mesolithic in Europe. 377-387. Leuven, Leuven University Press. Woodman, P. C. and Johnston, I. 1991-92 ‘A petrological examination of some Mesolithic stone artefacts.’ Ulster Journal of Archaeology, 54, 134-137. Woodman, P. C., Finlay, N., and Anderson, E. 2006 ‘The archaeology of a collection: the Keiller-Knowles collection of the National Museum of Ireland.’ Dublin, Wordwell; National Museum of Ireland Monograph series 2. Zvelebil, M., Moore, J., and Henson, D. 1987 ‘Regional Survey and the Analysis of Lithic Scatters: a Case study from Southeast Ireland’ in P. Rowley-Conwy, M. Zvelebil, and H. P. Blankholm (eds) The Mesolithic in north-west Europe: recent trends., 9-32. Sheffield, Department of Archaeology and prehistory. Zvelebil, M., Macklin, M. G., Passmore, D. G., and Ramsden, P. 1996 ‘Alluvial archaeology in the Barrow Valley, Southeast Ireland: The ‘River Ford’ Culture re-visited.’ Journal of Irish Archaeology 7, 13-40.